A science themed birthday is a great party idea that is sure to entertain! ISTC Super Science birthday parties offer children a chance to participate in cool science experiments, and keeps the mess here at the Science Center. Kids discover the fun side of science as they take part in spectacular science demonstrations. Science parties are a great way to get kids excited about learning. 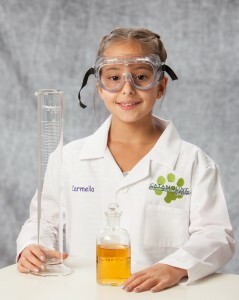 Fun science experiments and activities will bring out everyone's inner mad scientist! All packages include party room for 1 1/2 hours, for up to 10 guest. Science Center Tour, 1 ride on Anti-Gravity Simulator per guest, and a Science Center pass for each child to return one time. An additional $20.00 will be charged for parties outside of the Science Centers hours. Decorations must be approved in advance by ISTC staff. Everything as listed in the Super Scientist package plus lab coat, goggles, pencil, and clip board. $5.00 for each additional guest.